Speeding up the login process. Just few clicks and you're logged in. No need to remember your username or password to particular website. You can finally use various and long passwords, which absolutely increase your security. If you are using single password for multiple websites, the interception of that single password by an unauthorized person, gives him or her in practice an access to all the services for which you used this password. To create a new Web Login Item, select New web login item command available in the Edit menu. 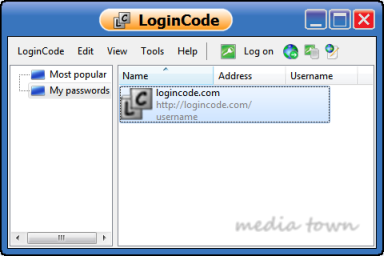 LoginCode will display the Web Login Edit window that allows you to specify parameters of Web Login Item. After approval of the parameters, a new Web Login Item will be shown in the item view. To use the web login item, first you should select it in the item view. After selection few buttons will be shown to the right side of LoginCode menu. The following image shows you selected, ready to use web login item. LoginCode logs on in a fully automatic manner. LoginCode displays a special translucent window at the bottom of the webpage which supports you in the login operation. Log on automatically option available in Web Login Edit window on Login settings tab is checked (it is checked by default). If any of these conditions is not met, LoginCode will not be able to log on automatically and in such situation, it will show a translucent window supporting the login operation. That window is called an login agent. The image below shows you a part of web browser with login agent. Click the username text box and press Enter key. Click the username text box and click OK button in the login agent window. Press and hold Shift key, click username text box, then release Shift. In case you are using Login Agent window, make sure the editor caret is inside the username text box before you execute the login operation. If the website uses HTTPS protocol, check the server certificate to ensure that you are logging to the service you intended. This command opens the website used to login. This command allows you to recover the password stored in the web login item. The recovery is performed by copying the password into the clipboard so you can paste it in any text editor. Simultaneously the timer will be started which automatically removes the password from the clipboard after 1 minute (security reasons). This command displays the Web Login Edit window which allows you to edit the web login item parameters. If you have an already opened website and you are prompted for a username and password, you can drag the Web Login Item from LoginCode window exactly over the username text box. The login process will be performed automatically when you drop the item. Before you log on using this method, make sure that the address of webpage is correct. If the page uses the HTTPS protocol, review the server certificate. You can also use the drag and drop method to transfer only your user name or password. To transfer the user name, press Control while dragging the item. To transfer the password, press Shift.